Fire Up Your Grille With LED Lights. When you roll up to the next car meet, be ready to answer "where'd you get those?" over and over again. With this customizable SmartColor™ LED grille kit, your ride will command attention like never before. Stand Out From The Crowd with 3-into-1 SmartColor™ advanced technology LEDs that are 300% brighter than standard LEDs. Show Off In Style with Bluetooth Infinite Color of 16 std color vibrant colors options and distinct light shows, including dimmer, speed control, and SoundSync™. SoundSync™ Technology makes your lights dance to the music every time the bass hits, so you can always lead the party. Complete Grille Kit features everything you need to make your ride stand out! Includes four flexible 12" (or 24" with the Pro Version) waterproof strips, wireless remotes, detailed instructions, extension cords, and mounting hardware. Guaranteed Fitment with any vehicle and complete installation instructions ensure that your car will have a badass glow in no time. Roll with any theme you want. Whether it's to match your rims or rep your favorite sports team's colors, the choice is yours with 16 different custom colors at the push of a button. Whether you want daytime bright or something more subtle, discover your ideal hue with our included dimmer. 8 feet worth of SmartColor™ LED strips make your ride glow like never before. Wow your friends from 80 feet away as you fire up your lights when they walk by. Need more thorough color customization? Use the other full-feature wallet-sized remote that's included. with 4 pre-programmed light shows at the push of a button. Soft Fade In and Fade Out effect with any color of your choice. Soft Fade In and Fade Out effect with rainbow color transition. Color cycle with zero fade. SoundSync™ Knows How to Party. SoundSync™ Music Mode gives your ride undeniable rhythm. Sound activated colors flash along with the bass, taking your party to new heights. Protected in all 4 Seasons. AURA Grille Kits are built to last and shine through all types of weather thanks to IP67 rated silicone. Also comes with complete 1-Year OPT7 Warranty. Some kits hand you bare wires-not us. 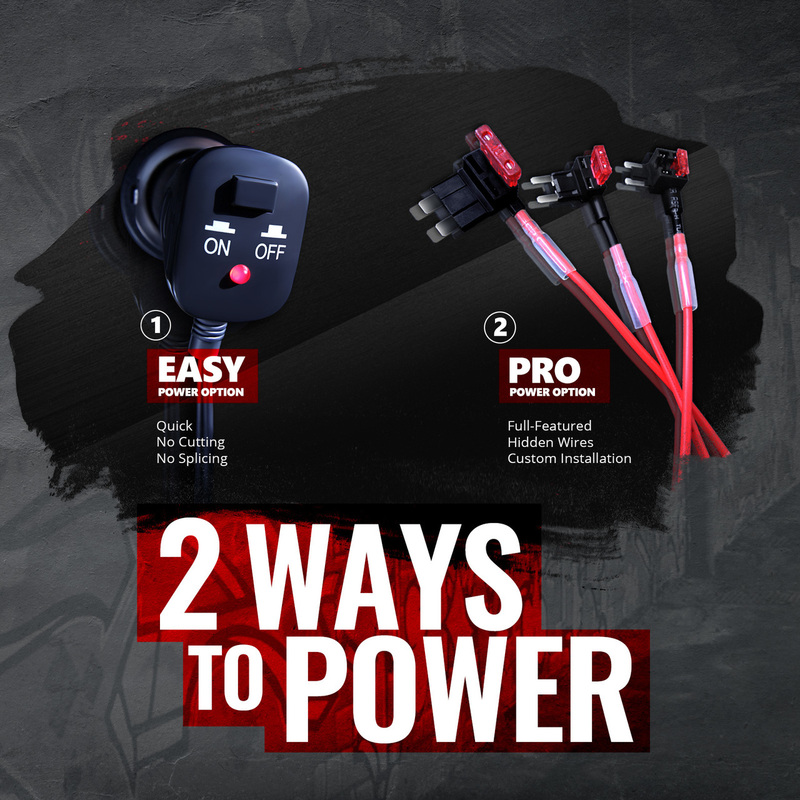 Whether you prefer the pro or the express setup, you're able to choose between the included fuse taps and 12V car charger outlet. Find the LED Grill kit-https://goo.gl/dKQWoh This is our Aura LED Grill Kit installed on TeamRousch customer's Red S550 Mustang GT along with some other stunning mods. Exclusive to OPT7 is SoundSynch technology allows for it to sync bass centric audio to the beat. 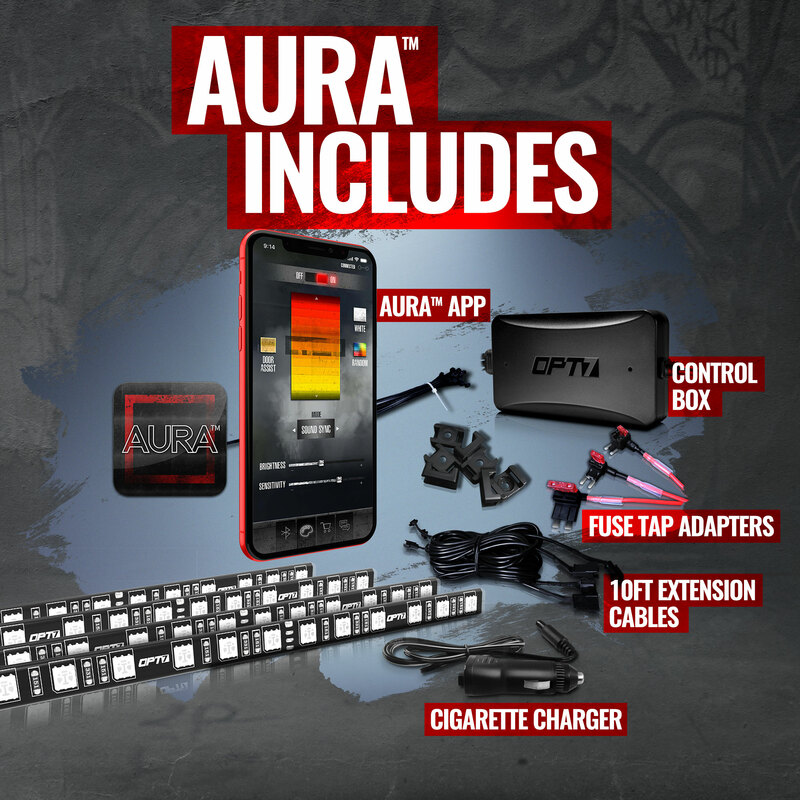 OPT7 Aura LED Grill Lights with SoundSync Technology. S550 Mustang 15-17. Fits Trucks LED Grill.